When a child or teen begins to struggle with their school work, it is best to get them the help they need as soon as possible. The longer it takes for a student to get help, the more lost they become since the school learning continues forward. This is even more true today with the Common Core Standards, as they build on each other in an orderly fashion. How can you tell if your child is struggling? Children and teens aren't always forthcoming about their school performance, especially if they do not feel good about it. Below are some signs to look for. Keep in mind that while anyone may have an off day without it signaling an overall problem if any of these become a pattern or start to become at all regular, the earlier you find out what is behind the change so you can help them, the better. When your child all of the sudden doesn't want to tell you about what they are learning in school, or how their school day went, it can be a signal that something is not right at school. This could also be limited to the subjects they are struggling with. If your child suddenly becomes distant or angry towards school, you can bet they do not like how things are going at school. Another big attitude shift to watch for is boredom. Often kids will complain they are bored when they don't understand what is going on at school. When your child says they are bored, it is important to look a little deeper to find the cause. It may be that they already know the material being taught in a particular unit at school. Children who do not understand the material at all will also complain about being bored. It is the same feeling you would have if you were stuck listening to a talk radio station that was entirely in the language you had never heard before. Boredom results when you can't understand enough of what is being said to be interested. It is a big warning sign if your child is falling into a pattern of having little to no free time outside of school because they are spending their time on homework. 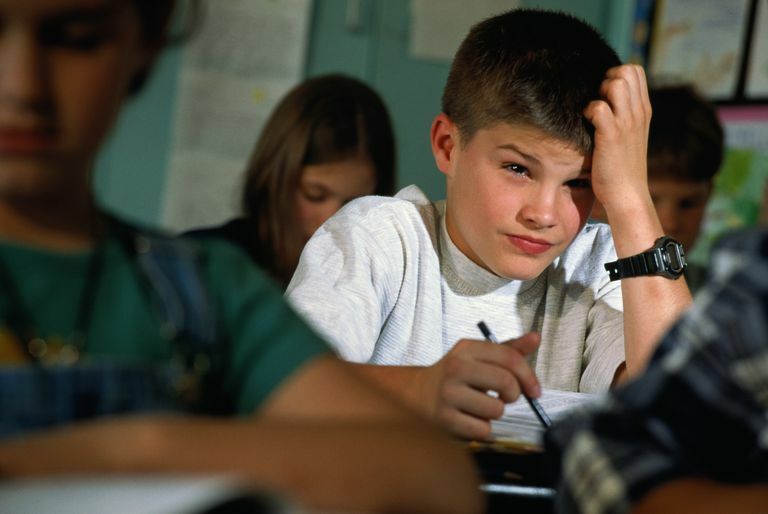 A rough guideline is that a child should be spending ten minutes per grade level on homework each school night. Homework policies vary tremendously among teachers and schools, so it is Important to realize that some teachers give out more homework and some give out far less. Be sure that you are familiar with your child's teachers' homework policies. If your fifth grader has a teacher that believes in giving no more than fifteen minutes worth of homework each night, and your child is spending fifty minutes, then your child is struggling to get the work done. Likewise, if your high school student spends an hour each night working on homework for a dual college credit math course, they may be in line with the teachers' policies. If you are familiar with the teacher's homework policy, you can take steps to help your child if they start to develop a pattern showing they are struggling. Sometimes misbehavior at school is really your child's way of trying to take attention off the fact they are struggling with their work. Children and teens also often lack many of the skills necessary to speak up and specifically say what it is they are having trouble with in school. They are children, after all, and are learning those important social skills throughout the growing up process. Until then they may just act up if they feel frustrated or upset because they know they are not being successful with their school work. If your child is usually well behaved and suddenly begins to have behavior problems at school, take a look not only at what is happening in their social world but also their academic work as well. Sometimes it is easy to dismiss what a teacher is telling you about your child, especially if what the teacher is telling you is different than what you have always known your child to be. Your child's teacher is the person who is teaching a classroom full of students the same material. If your child's teacher believes that your child is struggling more than other students, pay attention to what the teacher is saying. Your child's teacher letting you know about a change in your child's academic progress is the teacher's way of giving you the chance to help address any problems they may see beginning to develop. Teachers usually have some suggestions in mind what they think might help. If the teacher doesn't volunteer suggestions, they may be waiting for you to ask what help is available. Of course, this is a dialogue, and parents often know their children better than anyone else, teachers included. The teacher's thoughts and ideas are information that you can put together with everything else you know about your child to know if they are struggling and some of the options available to help them. Problems sleeping or eating often result from worry. Your child may be having problems sleeping or eating if they know they aren't keeping up with the class on their school work. Young children want to please the caring adults in their lives and may worry that if they aren't doing well in school that these adults will be upset with them. Older children and teens may be well aware of the overall importance of school to their futures and concerned about their future success if they start to fall behind. This sign is an obvious one, yet sometimes children and school parents do not want to believe that it is a sign that the child is struggling with the material in school. Some parents feel that bad grades only mean that the child just doesn't understand the importance of education in their lives yet and will somehow snap out of it and be successful once the child is a little older. An occasional poor grade on one assignment may not be cause for serious concern, but a pattern of low grades—or worse—a report card full of poor grades, is a concern. A report card of poor grades is a sign of some kind of problem. We parents want to believe the best about our children and love them tremendously. Poor grades mean they are not succeeding. Do not fall into the pattern of denial that low grades are not a problem for your child. Poor grades mean they are not being successful in completing their work. Be sure to understand all of the information that is on a report card, and come up with a plan to help your child. The support, encouragement, and advocacy you provide your child when they begin to struggle in school can make a huge difference in your child being able to get back on track. While it is understandable to worry about your child's future when they begin to struggle, remember that learning how to overcome difficulties is a valuable lifelong lesson that can lead to success in school and in life.